​We are excited to welcome Trevor MacKenzie as our special guest presenter to help us learn all about inquiry classrooms, the different types of student inquiry and how we can incorporate these into our classroom practices. Please join us for a vibrant discussion all about inquiry-based learning and how teachers can powerfully personalize learning for students in their classrooms. Trevor MacKenzie, author of the best-selling book Dive into Inquiry: Amplify Learning and Empower Student Voice and forthcoming (and highly anticipated) follow-up Inquiry Mindset: Nurturing the Dreams, Wonders and Curiosities of Our Youngest Learners (co-authored with Rebecca Bathurst-Hunt) will share some tips, tricks and processes for teachers both new and well-versed to the inquiry classroom. These takeaways will be a mix of ideas and activities you can do tomorrow in your class as well as BIG ideas that will truly transform your teaching. Trevor will also share some exclusive content from Inquiry Mindset during the webinar that hasn't been released to the public yet - exciting! If you haven't heard Trevor speak you're in for a treat - he's passionate, informed, and an absolute sharer. He genuinely cares about impacting teaching and learning. You don't want to miss this webinar! 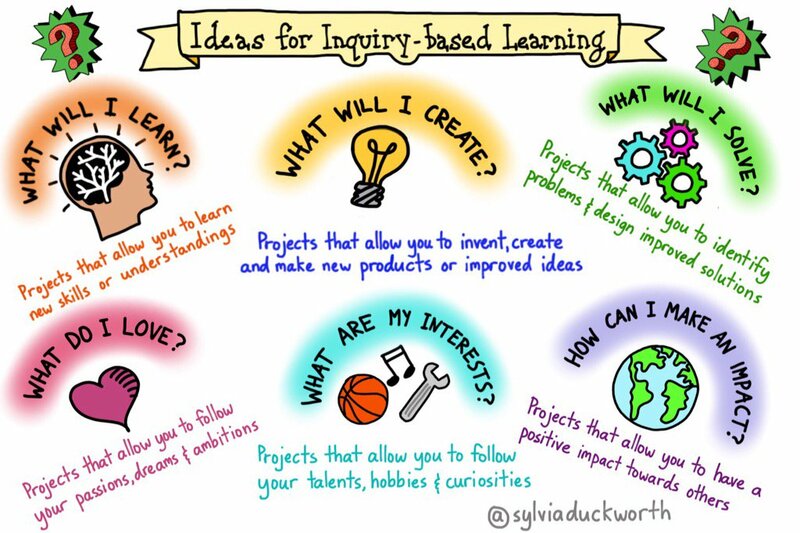 Have you seen this Sketchnote? It's gone viral and will be discussed during the webinar. Trevor MacKenzie is an award winning English teacher, Instructional Coach (focusing on inquiry and technology), and graduate student from Victoria, BC, Canada who believes that it is a magical time to be an educator. By increasing student agency over learning, weaving in strong pedagogy, transformative tech use, and sharing learning to a public audience, Trevor’s learners are ready to take on important roles in the 21st century. Trevor uses technology to enhance his teaching as he experiments with the flipped classroom, inquiry-based learning, iPad Ed, and exploring student blogging as a means to reflect on learning. He strives to make learning public and meaningful and support innovation and connection amongst educators. (Note: Click on tab for "Dive into Inquiry-Trevor MacKenzie" in the Livebinder).